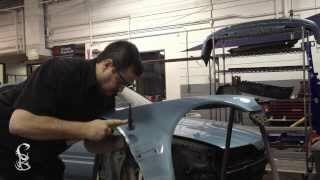 This video series covers the steps to repair a minor fender bender. This series will take you through the repair process step-by-step from metal straightening to primer. Enjoy the videos and let me know if you have questions. Before grabbing a pen and writing down what is wrong with a car that has damage you need to use a little strategy. What is wrong with the car, who was in the car if it was involved in an accident, year, make, model, vin number, prior damage, etc. There is a lot of things to consider and record before actually writing the repair estimate. 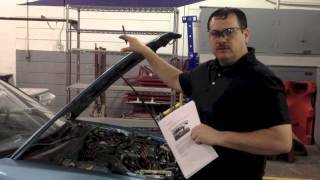 In this video I am going to discuss what to look for and the steps to take in order to complete a thorough auto repair estimate. 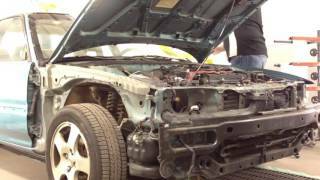 This video is part 3 of our Honda project. 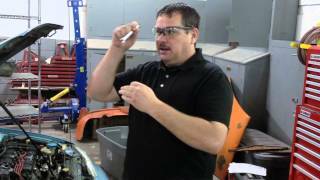 In this video we remove the front headlights and front bumper cover. We also discuss what R&R, R&I, and D&R are. 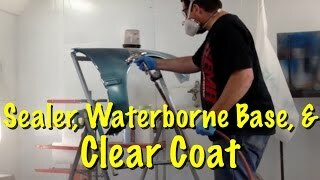 To properly paint a car, it is better to remove some of the parts rather than to mask them. 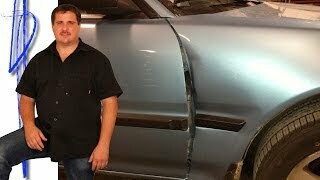 We are blending the door, so in this video we are removing the door panel, belt molding, side molding, mirror, etc. so we can blend and clear coat the door. When damage is located on a body line or the edge of a panel, it can be difficult to repair. Especially if you are not sure how to tackle this type of damage repair. 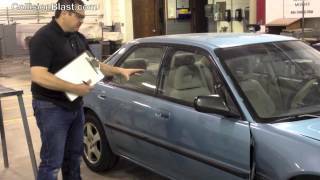 In the video below, we’re going to demonstrate how to repair the damage on the edge of a fender on the Acura Integra project. More care must be taken with thin metal used on car body panels not to over grind and thin the metal. In the past, I have ground auto parts with 24 grit, later started using 36 grit, then to 50, but grinding is still too aggressive for many of the thin metals used on today’s parts. Especially some of the aftermarket body parts. Of course, if you are using a stud welder gun, you may have to lightly grind the stud head off, or you may have to grind a welded area. However, this should be kept to a minimal to prevent over grinding the metal making it weaker and thinner than it should be. Another problem that can consume a lot of time when working with body filler is getting it out of the areas you didn’t intend for the body filler to be. You know, around edges, cracks, etc. around the repair area. 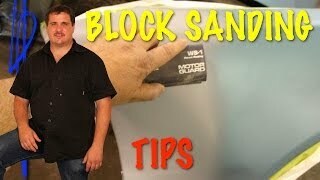 This video is going to address both of these problems and provide more tips when working with metal and body filler. 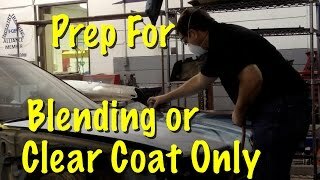 This video is going to explain and demonstrate the steps and the grits of sandpaper to use to prep a fender for paint and clear coat. We are working on the Acura project. 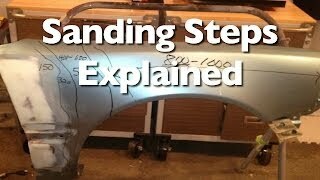 In the last video we prepped the fender. 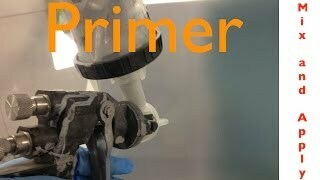 This video goes over the steps to mix the primer surfacer and apply it to the fender. 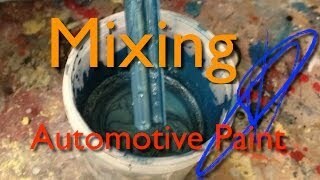 Have you ever wondered how automotive paint is mixed? 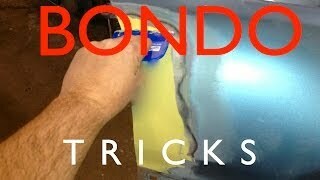 In this video, I am going to show you the steps to take to mix paint. Depending on the paint color, it may take two to ten plus to make the specific color. The toners include pigments, metallics, pearls, and binders. Watch the video to see how this is done.